Amanda Murphy Design: Black Friday Sale - Sunflower Row! Black Friday Sale - Sunflower Row! Happy Cyber-Monday! Hope everyone had a great holiday weekend! Last but not least of my specials is Sunflower Row. 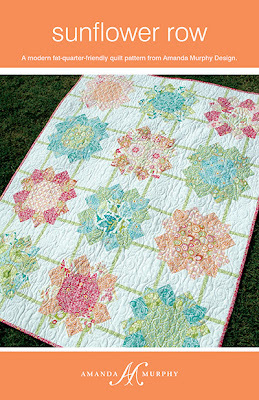 It takes 12 fat quarters to make the blossoms on this quilt and it hung in both the Blend Fabrics and United Notions booths at Market. Like the other new quilts, it features my Bella line for Blend Fabrics. You can purchase it just until tomorrow (Tuesday) morning over in my Craftsy shop! I love this, just purchased Joel Dewberry's new line and thought this pattern would be perfect!!! Love this pattern. It will go wonderful with your new fabrics. Thank you for the free ones too. Wow! This one is my favorite so far! Black Friday Sale - Palace Doors! Black Friday Sale - Fizz! Black Friday Sale - Harlequin!